For unclear reasons, one, but only one, of the supermarkets in my area often has interesting eighties cars parked outside. Today, despite the snow on the ground, there was a 1989 Cadillac Sedan deVille on “display” with classic car tags—good enough reason for this blog entry. Cadillac’s Sedan deVille was substantially revised for 1989, marking the first time that it had been “up-sized” for almost two decades. Overall length increased by nearly nine inches, while the wheelbase increased by three inches. The styling of this C-body was more in the traditional Cadillac vein than the 1985-1988 cars, with vertical blades in the rear that somewhat resembled the fins of previous decades. Changes extended to the interior, with more comfortable seats and more room in the rear compartment. New options included a heated windshield defogger ($250) and a Delco-Bose stereo with compact disc player ($872). Standard power for the front-wheel-drive Sedan deVille continued to be the transverse-mounted HT-4500 155 bhp 4.5 liter/273 cubic inch V8 with throttle-body fuel injection paired with a Turbo Hydramatic 4T60 four-speed automatic transmission. 0-60 mph took about 10 seconds in the 3,470-pound car. Mileage was 17 city/25 highway by the standards of the day (15/23 by today’s standards)—with an 18-gallon gas tank, a deVille owner could expect a range of about 310 to 340 miles with a 10% fuel reserve. Standard exterior and mechanical equipment on the $25,760 Sedan deVille (about $52,900 in today’s dollars) included tungsten-halogen headlamps, power rack-and-pinion steering, power brakes, four-wheel independent suspension, and P205/7oR15 tires on 15-inch wheels. Inside, a Sedan deVille was well equipped: air conditioning, six-way power driver’s seat, tilt and telescope steering wheel, cruise control, power side mirrors, power windows (including an express-down driver’s side window), power door locks, and an AM/FM stereo with cassette player were all standard. Exterior and mechanical options for the 1989 Sedan deVille included anti-lock brakes ($749), aluminum alloy wheels ($480), Astroroof ($1,355), and rear window defogger ($270). Inside a theft deterrent system ($225), leather seating areas ($560), and digital information cluster ($250) were available. Reviews of the revised Sedan deVille were generally good, and it sold well. Cadillac shipped 122,693, making it by far Cadillac’s most successful model for the year—the rear-wheel-drive D-body Brougham was a distant second place with 28,926. According to Hagerty’s valuation tools, all the money for a 1989 Sedan deVille in #1/Concours condition is $5,400, with a far more typical #3/Good car going for a mere $2,800 (only the top-of-the-line Allantés do well among late eighties Cadillacs). This generation of deVilles does maintain a presence in the Hemming’s Motor News classifieds and on eBay Motors. As I write this in December 2017, there’s a black 1991 with 89,000 miles for sale, asking $10,300. Make mine Medium Garnet Red Metallic, please. 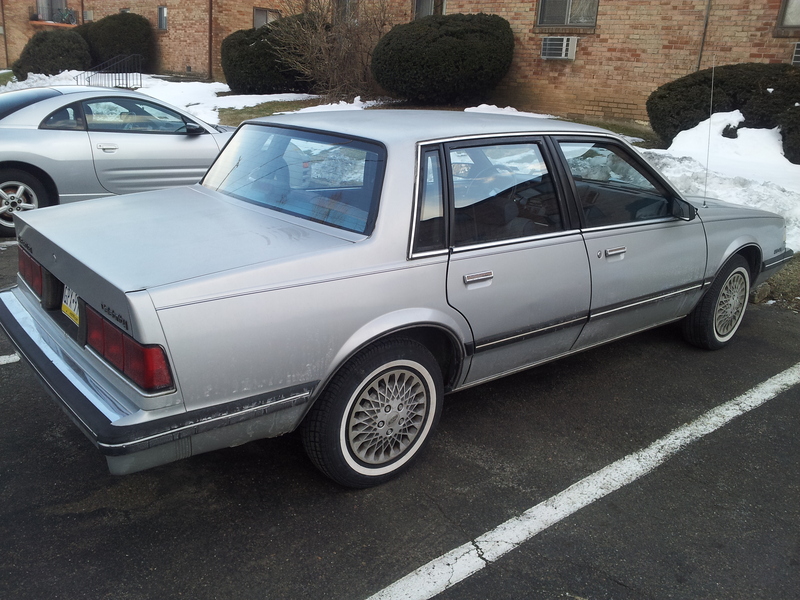 Another C-body I have covered in this blog is the 1985 Oldsmobile Ninety-Eight Regency sedan. A co-worker of mine casually mentioned that he owns a beige 1989 Chevrolet Celebrity sedan. That’s enough for me to write a blog entry. For 1989, Chevrolet’s Celebrity mid-size sedans and wagons were little changed. The major news was that the five-speed manual transmission that (very) few bought was no longer available and that the coupe had been discontinued. Standard power on the Celebrity remained the Tech IV 98 bhp 2.5 liter/151 ci inline four with throttle-body fuel injection. The LB6 125 bhp 2.8 liter/181 ci V6 with multi-port fuel injection was available for $610. A three-speed automatic transmission was standard on both engines, but buyers of the V6 could add a four-speed automatic for an additional $175. With these two engines and curb weights in the 2,750 to 2,800-pound range, the Celebrity was not a fast car. 0-60 mph with the four was a little over 13 seconds, while V6 owners got to 60 mph about two seconds faster. Mileage with the base four was 23 city/30 highway (21/28 by today’s standards) while owners of the top-of-the-line V6/four-speed automatic combination could expect 20 city/29 highway. With a 15.7-gallon fuel tank, Celebrity V6 drivers could expect a range of between 310 and 350 miles with a 10% fuel reserve. My colleague’s 1989 Celebrity before restoration. Standard equipment on the $11,495 Celebrity (about $24,100 in 2019 dollars or about what a 2019 Chevrolet Malibu LS sedan goes for) included power steering, power brakes, 14-inch wheels on P175/75R14 tires (a size now tough to find), and a Delco AM/FM stereo radio with digital clock. Adding the V6 and the four-speed automatic brought the price up to $12,280, or about $25,700 in today’s dollars. Adding the Preferred Equipment Group 3 to a Celebrity with the V6 and the four-speed automatic brought the price all the way up to $14,368, or about $30,100 in today’s dollars. The most glamorous option for the Celebrity continued to be the $230 Eurosport package, which included the F41 sport suspension and 14-inch rally wheels on P195/75R14 tires. The exterior featured blacked out window trim and red center stripes on the protective rubber door and bumper molding; fender and trunk emblems were red rather than the standard chrome. Eurosports also featured unique red emblems on the interior door panels and dash and a black steering wheel. Other optional equipment included two-tone paint ($55), aluminum wheels ($195), an engine block heater ($20), cloth bucket seats with a console ($257), and a six-way power driver’s seat ($250). 1989 would end up being the last year for the Celebrity sedan—the wagon would soldier on for one more year. I think of these cars as honest but basic; they aren’t really being collected, though I did see an early (1982-1985) coupe at an AACA show a few years ago. Celebrities sometimes show up for sale in the Hemmings Motor News classifieds or on eBay Motors—as I updated this entry in February 2019, there was a 1988 Gray Celebrity wagon with 24,000 (!) miles for sale in Hemmings for $6,500. Make mine Black, I think. For the fourth of July, here’s some eighties American iron. For 1989, there was big news in the Pontiac camp with the release of the 20th Anniversary Turbo Firebird Trans Am, which was essentially a Trans AM GTA coupe with an exclusive engine option and some specific trim elements. For $31,198 (about $59,900 in 2014 dollars) 20th Anniversary Turbo Firebird Trans Am buyers got all the Trans Am GTA exterior and mechanical equipment which included four-wheel disc brakes, fog lamps, special performance suspension, a rear limited slip axle, and 245/50-VR16 tires mounted on gold 16 x 8 diamond-spoke aluminum wheels. Turbo Trans Am-specific additions included larger brake rotors and softer front springs. The only color available was white with Turbo Trans Am emblems on the fenders and 20th emblems on the nose and rear pillars. 1989 Pontiac Firebird brochure cover, courtesy of Flickr user Alden Jewell. Inside, standard GTA equipment included power door locks, power windows, power mirrors, power antenna, tilt steering wheel, cruise control, rear window defroster, and remote deck release. Turbo Trans Am owners also got a turbo-boost gauge inside the tachometer face. Pontiac built a total of 1,550 Turbo Trans Ams for sale (there were another 5 test cars), with 85% of them being t-tops with a leather interior (buyers could order a cloth interior and/or the hardtop, but few did). Unlike many other eighties cars, Turbo Trans Ams hold their value just fine. According to Hagerty’s valuation tools, all the money for a 1989 20th Anniversary Turbo Trans Am in #1/Concours condition is an astounding $47,700. A more “normal” #3/Good condition example is valued at $20,700. Turbo Trans Ams often come up for sale in the Hemmings Motor News classifieds. As I write this in July 2014, there’s one with 835 miles advertised for $31,500. Familiar and comfortable with things Japanese at least partially from his time serving in the occupation forces following World War II, my grandfather purchased a couple of first Datsun and then Nissan Maximas over the years. When Nissan announced the new and much sportier third-generation version of the Maxima for the 1989 model year, I (firmly convinced of my twenty-year-old hipness) assumed that he would not purchase one. I was wrong: within a year, my grandfather was driving one of those new Maximas with the “4DSC” logo (an abbreviation for “4-Door Sports Car”) on a side window—an at least somewhat instructive lesson for this young man. New for 1989, the third-generation Nissan Maxima was a significant change toward a more sporty image and reality, with attractive new styling and an independent rear suspension. I remember wondering if they had moved too far away from their previous conservative designs for their market. They hadn’t—the 1989 Maxima got good reviews and sold quite well, despite the elimination of the station wagon version. The Maxima’s engine, a version of Nissan’s VG30E 3.0 liter/181 ci multi-port fuel injected V6 (closely related to the standard powerplant in the Nissan 300ZX), was slightly upgraded for 1989 to 160 bhp and 182 lb.ft of torque. As they had in previous years, Nissan sold two differentiated Maxima models for 1989: the luxury-oriented GXE and the significantly more sporty SE. Standard exterior and mechanical equipment for the $17,499 (about $36,700 in today’s dollars or about what a 2019 Nissan Maxima SV goes for) GXE included rack and pinion steering, keyless entry (a GXE-only feature), and 205/65R15 tires (a size still readily available) on 15-inch alloy wheels. Inside, you got air conditioning, cruise control, power windows, power door locks, and a rear window defogger. Fuel economy with the standard four-speed automatic transmission was decent at 19 mpg city/26 highway by the standards of the day on premium gasoline (17/24 by today’s standards). With an 18.5-gallon fuel tank, a GXE owner could expect a range of between 340 and 375 miles with a 10% fuel reserve. Moving to the $18,549 SE added a five-speed manual transmission (the four-speed automatic was optional on the SE), four-wheel disc brakes, wider wheels, and a spoiler, along with stiffer springs and sway bars. Inside, a moonroof, a Bose stereo, leather steering wheel, and white-faced gauges with black markings were all included. With the five-speed, 0-60 mph came in a little under 9 seconds, and fuel economy (also on premium gasoline) was 20 city/26 highway by the standards of the day (18/24 by today’s standards). Options available for the Maxima included a sonar suspension system that adjusted damping based on road conditions, a fairly primitive heads-up display, and anti-lock brakes (SE only). People seem to remember these cars with affection, and I (and others) think the exterior styling has aged rather well, but I don’t see a lot of collecting, at least not yet. Nissan Maximas of this era only occasionally show up in the Hemming’s Motor News classifieds—you do see them a little more often on eBay Motors. Make mine my grandfather’s Winter Blue Metallic, please. For 1989, the Cadillac Allanté received its first engine upgrade, moving from the 4.1 liter/249 ci HT-4100 V8 to the 4.5 liter/273 ci HT-4500 V8 but remaining connected to the 4T60 4-speed automatic transmission. Power climbed to 200 bhp while mileage declined slightly to 15 city/23 highway by the standards of the day. Acceleration improved to about 8.5 seconds to 60 mph with a claimed top speed of 134 mph (probably with the aluminum top on) for Dave Hill’s baby. 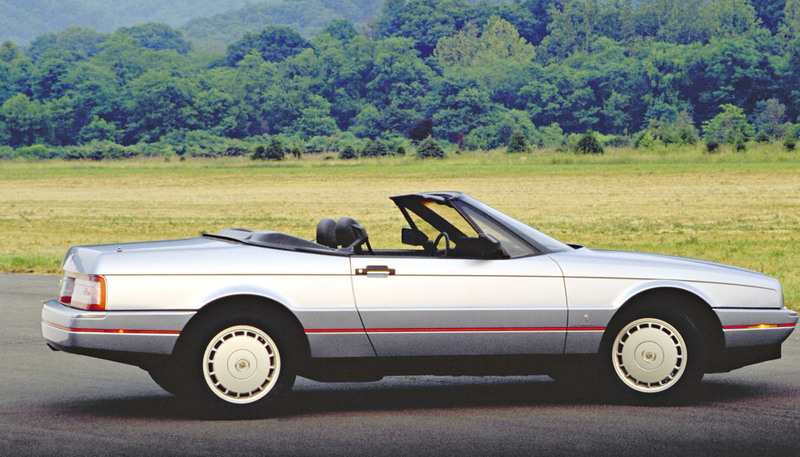 1989 Cadillac Allanté, courtesy of the GM Media Archives. For 1989, the Allanté’s base price remained non-trivial: $57,183 (about $107,000 in 2014 dollars) for the 3,296 buyers. 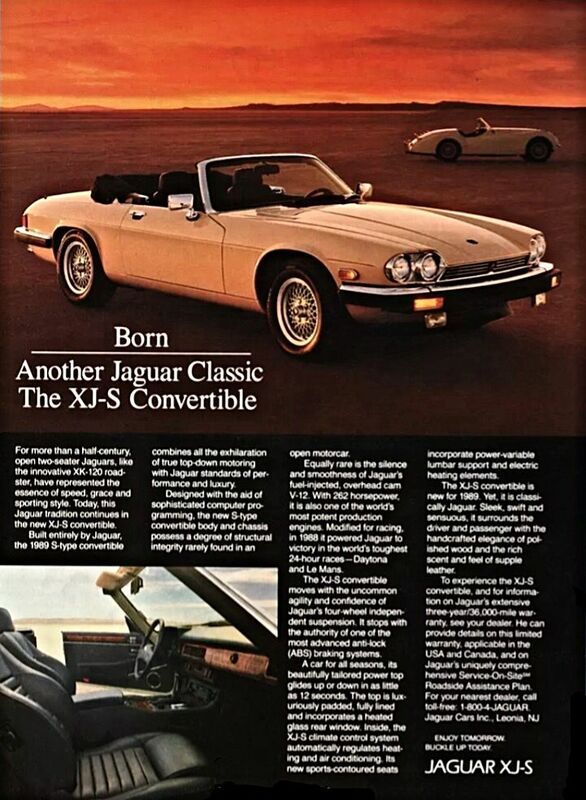 However, just about everything came standard, including ABS, traction control, 16-inch alloy wheels, and the aluminum hard top/cloth convertible top combination. The interior included 10-way leather-covered Recaro bucket seats, electronic climate control, and Symphony Sound System AM/FM stereo with cassette player. Because it was a Cadillac, you also got air conditioning, power steering, power windows, and power door locks. You could choose either an analog or a digital instrument cluster at no extra charge. Allantés have a good club following and consistently show up in the Hemmings Motor News classifieds. As I write this in February 2014, there’s a Pearl White Allanté with a Burgundy interior with 66,000 miles for sale for $10,000. According to Hagerty’s valuation tools, all the money for a 1989 Allanté in #1 condition is $16,500. I think the Allanté body style (by Pininfarina, of course) has aged well. It certainly still looks like nothing else on the road—which was definitely one of Cadillac’s goals. Make mine Pearl White, please. 560SLs were a notable presence in the January 2014 auctions at Scottsdale and Kissimmee, so I decided to finally post this short entry on the last of third-generation SLs. The 1989 Mercedes-Benz 560SL marked the end of the R107 generation that had begun way back in 1972 with the 450SL. There had been a moderate restyling for 1986, but the basic bones were definitely aged. The base price for 1989 was $64,230 (about $121,000 in today’s dollars). For your money, you got a plethora of standard features including ABS, a driver’s side air bag, cruise control, power steering and brakes, power locks and windows, leather upholstery, and (of course) a first aid kit. About 8,300 buyers took home this last of the line example. Motive power was provided by a Bosch fuel injected 227 bhp 5.5 liter/338 ci V8 connected to a four-speed automatic transmission. Mileage wasn’t exactly great for the 3,700-pound car—the ratings of the day were 14 city mpg/17 highway (adding a $1,300 gas guzzler tax to every vehicle), by today’s standards that would be 12 city/16 highway. With the 22.5-gallon gas tank, 560SL owners could expect a range of between 280 and 315 miles with a 10% fuel reserve. 0-60 did come in about 7 seconds, but the 560SL was closer to a muscle car than to a sports car. There is decent club support for the 560SL, as there is for almost all Mercedes-Benz’s. 560SLs maintain a substantial presence in the Hemming’s Motor News classifieds and on eBay Motors. As I write this in January 2014, there are 56 available, including 10 of the 1989 models. According to Hagerty’s valuation tools, all the money for a 1989 560SL in #1 condition is $31,100. Make mine Astral Silver Metallic, please.